Jeff Plakke loves the outdoors and has been working in the field of Natural Resources for many years. While pursing a B.S. in Forestry at Michigan Technological University, he worked with Dr. Rolf Peterson on the Ecological Study of Wolves and Moose on Isle Royale and as an EarthWatch Research Team Guide on this project for several years. He also worked on Isle Royale for the National Park Service as a back-country Ranger and a Biological Sciences Technician. After graduating from MI Tech, Jeff worked as a Conservation District Forester in Oceana and Newaygo counties of west Michigan where he consulted on tree health and land management. 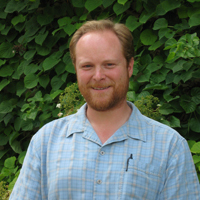 Jeff later moved to Ann Arbor and began working for the Matthaei Botanical Gardens and Nichols Arboretum. While working he attended the U of M School of Natural Resources and Environment studying Terrestrial Ecosystems and later graduated with a M.S. in Resource Ecology and Management. He is now the Natural Areas Program Manager at Matthaei-Nichols and is focused on all aspects of natural areas stewardship on their four properties including: ecological monitoring, controlled burning, exotic invasive species control, the propagation of native plants as well as many other aspects of the care and promotion of these facilities. Jeff is now also writing grants and managing awarded projects related to the natural areas stewardship of Matthaei-Nichols.